If you’re a fan of songs that tell a story of hopeless romance then Iron & Wine’s latest album Ghost on Ghost is the one that you should be listening to this week! 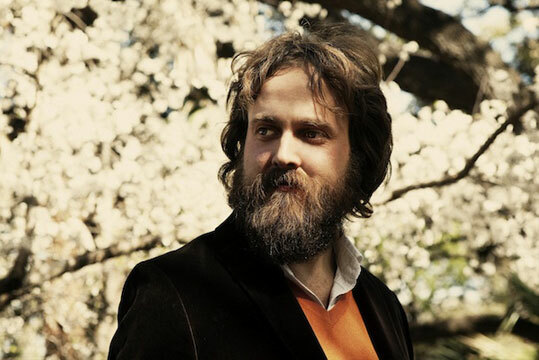 Samuel Beam is an American songwriter who performs as Iron & Wine. He’s usually an acoustic soloist but for this record Ghost on Ghost he ditched his home-based studio in Texas, that has been used to record previous albums, for a Brooklyn studio. Beam’s a self-taught guitarist and influenced by jazz, hence he’s been enjoying trying out some new tricks for this record. This time he’s had a whole entourage of musicians to add new layers to his musical production: jazz rhythm, funk beats and harmonies akin to that of Lennon and McCartney. Impressively he completed the recording in just two weeks. See Iron & Wine play live in London on May 28 at the Barbican Hall in London. Click here for Tickets. 2. SCREEN PRINTED THANK YOU CARD - The Paper Cub Co. There's nothing better than the feeling after you completed your own craft project... well, maybe except for the piece of cake you finish to celebrate. Enter these adorable fabric lined jars - and what's better is that it's so easy! Just grab some scraps of your favourite fabric and get gluing. For the full set of instructions and some more great ideas visit Claire's blog. Tomorrow marks the UK’s sixth National Record Store Day, celebrating independently owned music shops. It’s the one day of the year that sees independent shop-owners unite to celebrate their common interest – music! Across the country there will be meet-and-greets and performances from some of your favourite musicians and many other fun things to do! If you’re in London you can check out Paul Weller at a special Record Store Day gig at Rough Trade East or even head over to Berwick Street between 12pm-7pm for a special festival that will see performances from the likes of Frank Turner, The Wire and Gabrielle Aplin. Of course you will have read our Music issue by now, so you’ll know that supporting music shops is important to us. 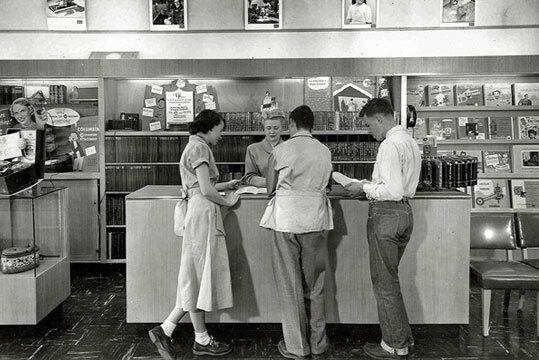 If you want to find out what events are happening in your area, check out the National Record Store Day website. Oh the elusive season that is spring! That is, perhaps, until now. We are finally able to finish our working day with a sprinkling of sun rays and a little warmth, which means we start to think of brighter and happier times spent in the sun listening to good music. 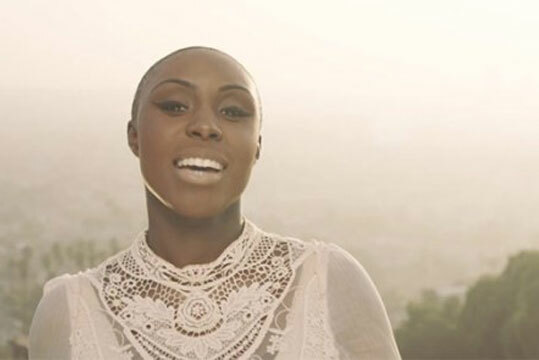 Who better to be this week’s choice than the splendid Laura Mvula. For a while now this contemporary singer has been rated as being one to watch for 2013 and of course the posters infiltrate the London underground, so those of us that live in London at are no strangers to her name. But when we take notice of the hype and really sit down to give her music time and appreciation we are not disappointed by any means. Mvula, influenced by other soul singers such as Jill Scott and Erykah Badu, is an accomplished composer and singer with a style that is original and uplifting. Her debut album released last month Sing to the Moon is just gorgeous. Watch our favourite video of the single that preceded her album which is full over beautiful spring time quirk and vocal brilliance. She’ll next be playing live at Marlay Park at Longitude Festival in Dublin and you can purchase her music from iTunes. Now the weather is finally warming up, we have the perfect emergency recipe for you this week; raspberry delight. 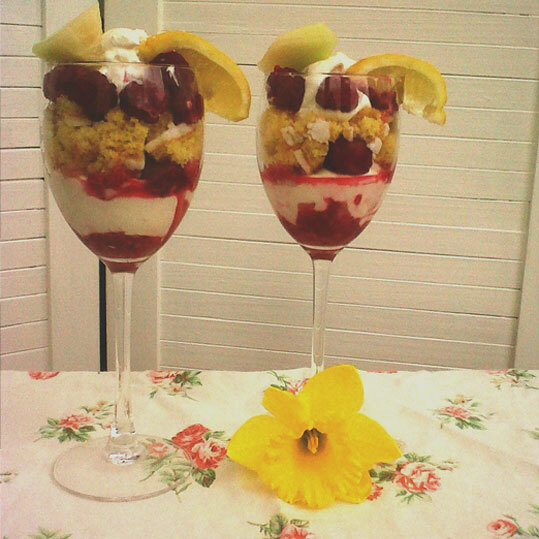 Tickle your tastebuds with this creamy fruity treat: lemon, melon, cream cheese and raspberries - fight the spring blues! - Whip the cream cheese and then beat the sugar in thoroughly. - Pop 8 raspberries in to a bowl and microwave for 15 seconds, pop half the mixture in a wine glass and the rest in to another. Put the glasses in the fridge until mixture is cool. - Once it is has cooled, add some cut melon on top, leaving aside one chunk to put on top for decoration. - Put 3/4 of the cream cheese mixture in to the glasses on top of the melon, dividing between the two glasses. - Add on top the lemon cake mixture, dividing between the two glasses. This week for our listening choice we have the BBC’s sound of 2013 CHVRCHES. This trio come from Glasgow and formed not that long ago back in 2011. They are Lauren Mayberry (main vocals), Iain Cook (vocals, synthesizers) and Martin Doherty (synthesizers, vocals). These guys have an electro-pop sound and Mayberry’s charming vocals and audible Scottish lilts add to the charm even further. Despite a somewhat unoriginal appearance, these guys have bucketloads of originality; themes of belief, self-discovery, devotion and wonder plus their wonderful electronic accompaniments (synths) then the mix is simply colourful and the result - electro sunlight. Still quite a young band, they’ve certainly impressed us, and we are sure that in time their sound will become even more splendid. We patiently await their debut album later this year. Here’s their latest single release Recover. It is within this song that Mayberry’s wondrous voice really takes hold of us; it is the centerpiece of the song and captures its listening audience. Chvrches are next playing live in London at Village Underground on Monday 29 April and their music can be downloaded from iTunes. Spring: a time of growing warmth, chirping birds, and blooming flowers. Colours are emerging from a bleak and barren landscape, and truthfully, it’s hard not to reflect the change in our wardrobe. Pastels and florals that seemed woefully inappropriate in January are growing irresistible, while the rising temperature has us itching to don some light dresses. And yet cold spring showers too often put a damper on our style. This year we’re embracing rain accessories. To help inspire you, we’ve picked a few ladies who beautifully wear boots and carry umbrellas without sacrificing their style. 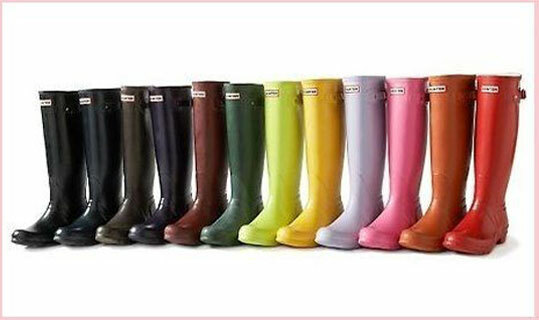 If the classic rain boot style appeals to you, Hunters are well made and widely seen. Their popularity is due not only to their durability, but also to their wide range of colours and glosses. If you hate the clunky and restrictive nature of tall rubber boots, there are a lot of great alternatives. While your feet are warm and dry, your head is left unprotected. Your hair and make-up are subjected to the elements, often left sad versions of what they were before leaving the house. 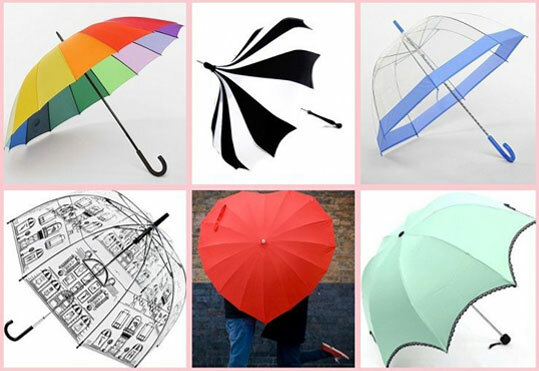 Luckily, there are countless umbrella shapes and patterns to suit your every style whim. Spring brings the promise of better weather, but its beginning is often speckled with grey skies and rain. Rather than letting the wet weather foster a gloomy attitude and wardrobe, enjoy the details. 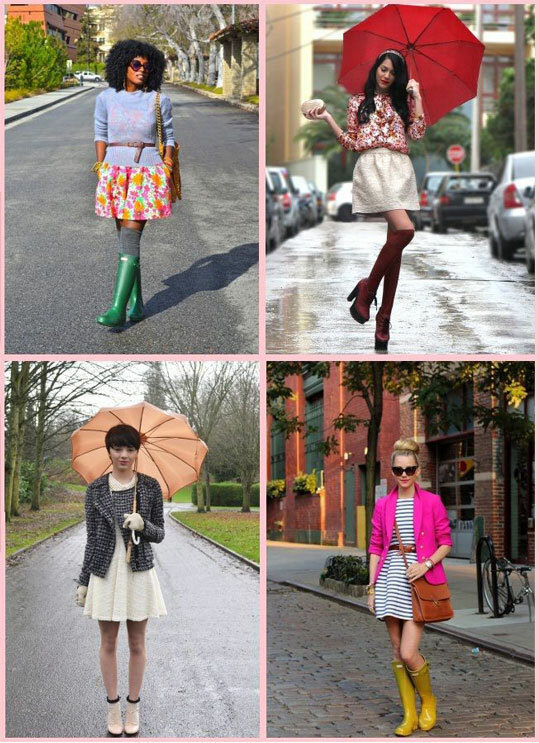 By choosing interesting accessories that complement your taste, you’ll have fun and stay dry in style. Happy spring! So after a brief glimpse of the sunshine over the weekend, we've got our minds firmly set on the summer (if it ever appears!) and we'd quite like to enjoy wearing the new collection from Geronimo... please. Whilst we’re all (impatiently) waiting for spring to finally show itself, why not keep in the warm this weekend by heading over to the Frock Me! Vintage fashion fair at Chelsea Town Hall? It’s a great place to score some great vintage pieces and you’ll be rubbing shoulders with everyone from fashion students and models to A Listers (Yoko Ono, Kylie Minogue and Sophie Dahl are just some of the celebs to have been spotted having a rummage!). 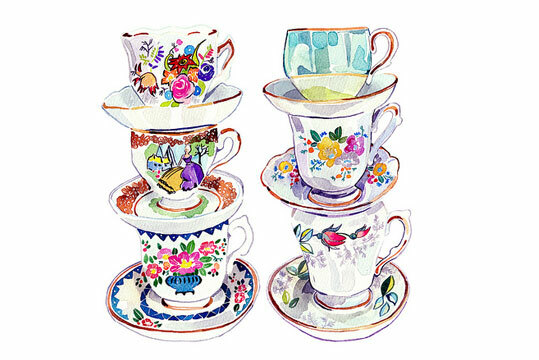 After a hard day’s searching you can even reward yourself with a cuppa from the pop up vintage tea room set up by Brighton’s Blackbird Tea Rooms. The perfect end to any shopping trip! Brighten up your dull April days with Cellardoor’s colourful and rather tasty spring salad! 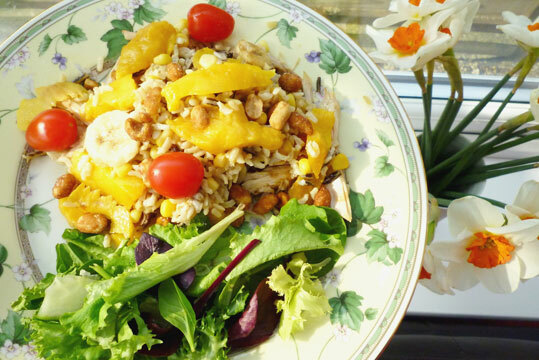 Slender strips of tender chicken with peanuts, mango and banana and zesty lemon mixed with rice… easy peasy! 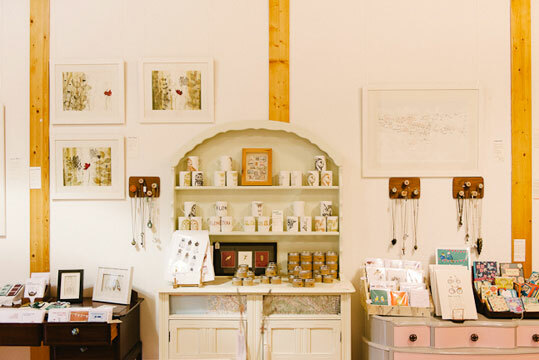 There's nothing better than uncovering a hidden gem, and you'll definitely be in for a treat if you take a trip to Yellowstone Boutique in Staffordshire. We caught up with Hannah to find out a little more about what makes them so unique... and have a peek on her iPod! For those of us that don't know, can you tell us a little about Yellowstone? 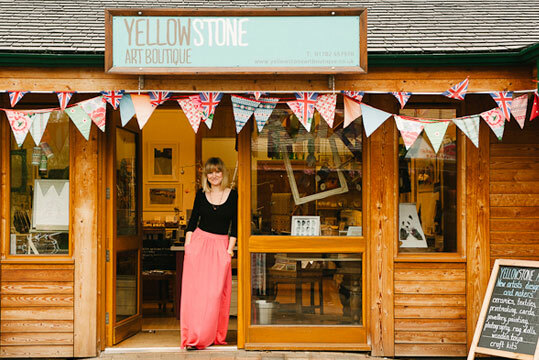 I opened Yellowstone in March 2011, to showcase work made by new designers and makers who’d invested in University education. It’s all about shouting about fresh, exciting work and getting it out of studios and in to people’s lives. The artists are all British but live all over the country, which opens up my net massively. Right now we are a little gallery (in a little chalet next to a beautiful lake and Italian Garden) and we run an online store too. At Uni, I was taught to shout about my work and promote myself as an artist, which I think a lot of new artists struggle with. I was seeing incredible work done by shy artists who didn’t have the confidence to get the work out there. I really wanted a space for this work, where the artists didn’t have to there. They’re busy doing the creative bit right? 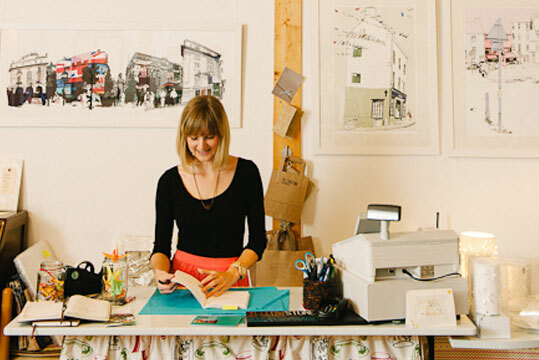 You studied Fine Art in Cheltenham, have you always wanted to work in a creative job? I have always been creative, but I think most people are. I’m not really a 9-5 kind of girl (although Dolly Parton is amazing) so an office job would really hold me back. However, I am very organised and business minded so I also wouldn’t suit being a full time artist. Yellowstone is the perfect balance for me because I can sit down and do the books, work on stock and ordering, and then the next day spend 4 hours building a display. It keeps all the parts of my brain happy. Can you describe your average day? If my other half is up early, he makes me poached eggs - if bacon is involved then I know it’s going to be a real good day. I open the boutique at 10am (very civilised) and start the day making sure the displays are all looking inspiring and restock sales from the preview day, then sort the post, do a bit of paperwork and check emails. I usually work on my own, so I do my jobs in between chatting and serving customers, which keeps my day busy. I make sure I take time to read my daily blogs and check our twitter, facebook and Pinterest and usually spend an hour emailing artists, planning future shows or researching artists who’ve submitted and maybe another hour checking stock levels. Before you know it, it’s time to clean up and get the gallery closed down. I usually have to stay and do some framing to replace spaces on the wall so it’s ready to go at 10am the next day. I head back to my boathouse and eat, sit and read or draw to try and use my time wisely. I also spend a good 20 minutes on instagram looking at designers’ feeds and wishing I’d taken those photos. What has been your biggest inspiration? Without doubt, my parents and art lecturers. I find myself being much more inspired by people rather than pieces of work. When someone has the gumption to believe in themselves and get out there and live their dreams, I can’t help but be inspired. My parents always taught me to do what makes me happy, not what I think I should do, or what will make me money. The best advice I’ve ever been given is to find what makes you happy and do it every day. I made what I love, my job. So I think I’ve cracked it. You work with a lot of talented artists, do you have tips on who we should look out for? That’s a tricky one because I wouldn’t work with any of them if I didn’t think they were going places… But I think Lucy Harding and Holly Exley are really doing some new and exciting things. They both have a real identity to their work, which is really important for young artists who are hoping to get recognised. I’m very open and honest so that’s tricky… Unless you went to primary school with me, you won’t know, that I can’t do forward rolls. I have a mind block and panic every time I try. I feel like I’m really missing out. 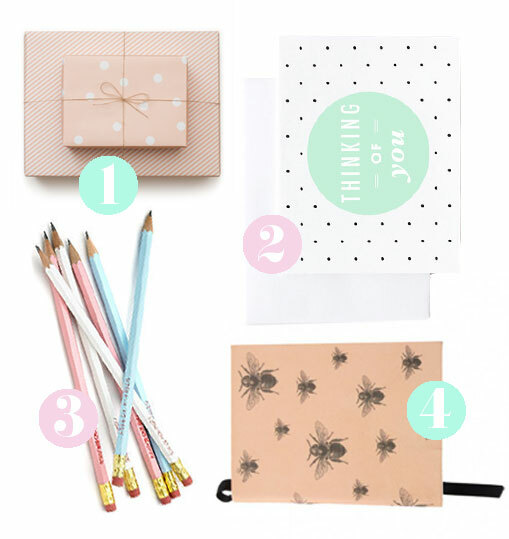 Have you got any advice for anyone deciding to take the plunge of working for themselves? I try not to dwell on the negatives of running my own business, or things could get a bit dark. But ‘hold on tight’ might be the best advice. Prepare to give up 98% of your free time, because work doesn’t stop at 5.30pm when it’s your own business. Ask for help and ask questions about things you’re not sure of. Winging it really doesn’t work when setting up, it has to be by the book or you’ll be in a serious pickle. Never open your own business to make money, open it because it is what you love and it will make you happy. Then if you can make a living of it, you’ll be ecstatic. And seeing as we've just released our music issue... what's on your iPod at the moment? So I made a new playlist last night, here’s what is on it. Angus&Julia Stone, The Shins, Lucy Rose, Blur, The tallest man on earth, Laura Marling, Jenny&Johnny, Daughter, Bastille & Johnny Flynn.